When Jeremy Clarkson was told he was finished at Top Gear, everyone just sort of assumed that was that. The show was over, at least in its then-current incarnation, and we’d all have to find something new to watch on Sundays (Nurse Jackie, obvi). But co-host James May just said it might not be over for the trio. Before we continue, I don’t want to oversell this. 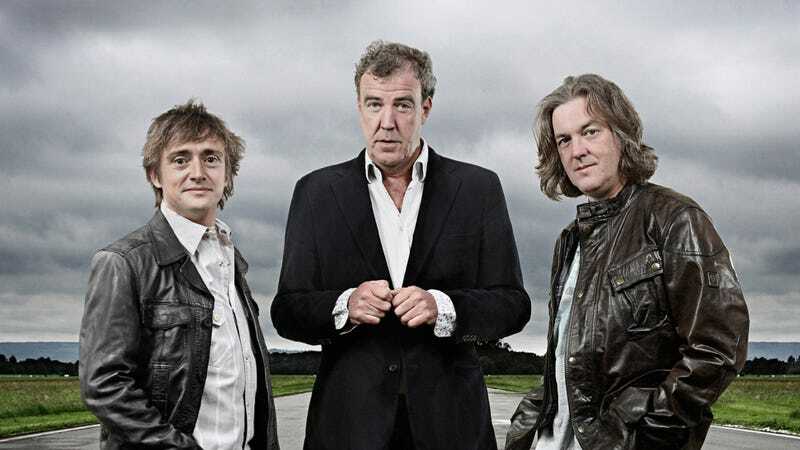 There’s no definitive statement that Clarkson, May, and Richard Hammond are returning to the BBC to host Top Gear. In fact, it’s fairly unlikely, and who knows, with our obscene tin foil hats on this might just be all part of a negotiating ploy for more money as the three look to re-boot the show somewhere else. Here’s where things get really boring and dry, however, if you don’t like legal contract matters. May said that “one or more” of the presenters may have non-compete clauses in their existing contracts with the BBC, and may have to wait for those to expire before they take their ideas elsewhere. And furthermore, he still needs to finish up more episodes of Cars of the People for the BBC, as well as a bunch of other projects. Of course, Clarkson returning to host Top Gear on the BBC would bring up a raft of horrible implications for the network, including whether or not the discipline it metes out to anyone really means anything. But wHoOoOoOoOoOoOo knows, really? We’ll probably see all three somewhere, at some point, in the future. So none of this probably matters anyway.